Lots of Canadian musicians have spoken out against Prime Mister Stephen Harper, and with an election right around the corner, Blue Rodeo have joined the chorus by releasing the protest song "Stealin' All My Dreams." The track is a righteous roots-rock anthem that sets its sights directly on Canada's current leader, who singer Greg Keelor refers to to as "Little King Stevie and his monarchy." The lyrics explore issues like the environment, corporation-favouring policies, broken treaties, missing Aboriginal women and more. The accompanying video, meanwhile, shows black and white performance footage that has been overlaid with some rather grim facts about the current state of the nation. Blue Rodeo does not always speak with one voice. However, we feel collectively that the current administration in Canada has taken us down the wrong path. We do not seem to be the compassionate and environmentally conscious nation we once were. As respectful as we are of the variety of opinions held by our audience, we felt it was time to speak up and add our voice to the conversation. Watch the video below. 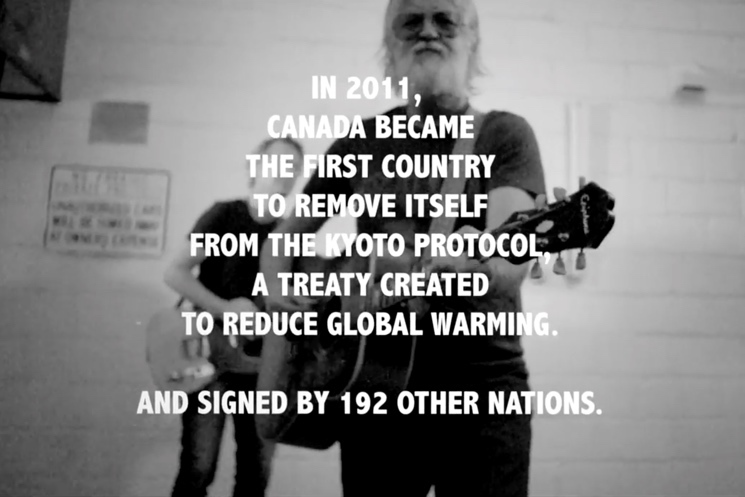 More Harper-related facts can be found at Blue Rodeo's website, where you can also download the track for free.